Soon Harry Potter fans will be able to drink craft beers inspired by the wizarding world created by JK Rowling – if they live in or travel to Delaware. On 12 November, Milford-based Mispillion River Brewing in the US state of Delaware will be hosting an event called “Fantastic Beers and Where to Find Them” to debut its five new Harry Potter inspired beers. Starting at noon, attendees will have the opportunity to be sorted into their Hogwarts’ house and try each house’s signature brew. 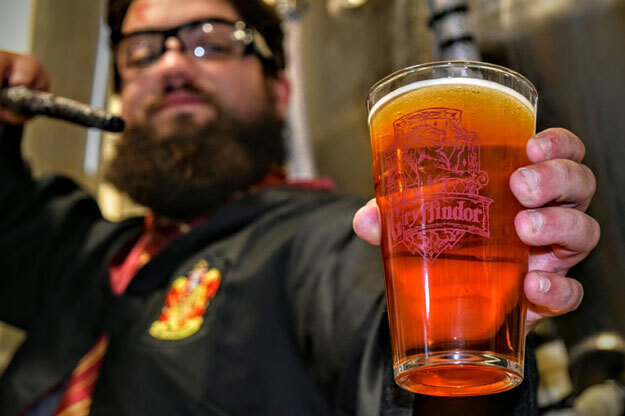 Gryffindor will be represented by a 9% ABV Double IPA, Hufflepuff by a 6% ABV Kolsch, Ravenclaw by a 5.2% ABV Porter, and Slytherin by a Dry-hopped American Sour. Meanwhile, Mispillion River Brewing has concocted a non-alcoholic butter beer, and its Harry Potter themed small batch Belgian Trippel, Deathly Hallows, will be making its yearly return. Entertainment throughout the event includes a scavenger hunt for horcruxes, beer quidditch, and a photo booth. A trolley witch will be vending Bertie’s Botts throughout the day. Attendees are invited to wear their best costumes, but the brewery is asking that people use their wands only for good. Anyone caught using the Unforgiveable Curses (Cruciatus, Imperius, or Killing curses) will be asked to leave. The event is free to attend. Commemorative pint glasses with the Hogwarts’ house logos will be available while supplies last. As with all Mispillion events, the Brewery is asking that people bring a canned donation for the Food Bank of Delaware. Mispillion River Brewing was established in Milford, Delaware, in the fall of 2013.